Owner and operator of Oberhund Dog Services & Products. Jennifer is a dog-aholic and is proud of it. The information presented is for general purposes. If your dog is showing aggression, please consult a reputable professional educated in the science of dog behaviour and communication. The Certification Council for Professional Dog Trainers can help you find a skilled professional. When a dog growls, the dog is communicating a warning that a bite is coming if the situation isn’t changed in a way that makes the dog more comfortable. If you scold or punish the growl, you are in danger of teaching the dog to suppress this important warning sign, and as a result, can teach the dog to bite without warning. No one wants a dog that bites, and ABSOLUTELY no one wants a dog that bites without warning. Address the underlying cause of the growl. In the immediate situation where a dog has growled, pay attention to the context and remove the dog from the situation that is causing the dog to growl (or give the dog distance from the thing that is causing the dog to growl). For the next weeks/months, do training to address the underlying cause of the growl so that your dog does not feel the need to growl in future situations that are similar. This is something that skilled dog trainer educated in the science of behaviour modification can help you with. Be very cautious of the information you find on TV shows, online, and from people at the dog park. You should also be cautious about dog trainers because the industry is unregulated and ANYONE can call oneself a dog trainer, even someone with no experience and no training. Buyer Beware. But this is a topic for a different post. In general, dogs will give many early signs of stress before they resort to a growl. Learn to read these signs. NOTE: Some dogs have not learned to use these early signals (poor socialization experiences) or have learned that they don’t work for them (because they have been ignored). Who is the walk really for? Is your dog enjoying the walk as much as you hope he is? Does your dog get to stop and sniff things or are you putting your need for a brisk, steady walk ahead of your dog’s need to stop and sniff things? If you are asking your dog to walk perfectly beside you the entire time, ask yourself A) why you are setting that as a rule and B) why your dog is complying with this rule. Who decided there was a “correct” way for a dog to walk? Is your dog avoiding discomfort from a piece of equipment? A walk is for exercise and training, sure, but it’s also for mental stimulation, social development, and bonding with you. Here are some tips to help you turn the daily dog walk into a more pleasant experience for you and your dog. Think about the walk from your dog’s perspective. Many years ago (before I got into the dog-training thing) I had the pleasure of walking a well-trained dog that stayed beside me with a loose leash the entire walk. We walked the neighbourhood for about an hour on a beautiful spring day and as I headed briskly up the driveway to the back door, I had a quick thought that I should check the mailbox at the front door and without thinking of the dog on my left side, I made a sharp left turn. I gave no intentional signal (no slowing down, no verbal cue, etc.) and there had been no sharp turns on the walk to prepare her for my sudden turn, yet the dog was able to maintain perfect heel position and get out of my way without me touching her at all. At first I was surprised and relieved she had managed to get out of my way when I had been so careless as to forget about her at my side before I made that very quick turn. But then I was sad: I realized that what I had thought was a nice walk in the neighbourhood for both of us was not so for her. She had been trained by someone else using corrections (choke collar and knee jabs for getting in the way), which for her, made the walk less about enjoyment and more about paying close attention to my movements and trying to avoid a correction. Let the Dog Stop and Sniff! Providing “sniffing time” is essential. Dogs see the world through their noses and not letting them stop and sniff is akin to taking a friend to an art gallery without letting him stop to look at anything, or dragging a child quickly through a carnival. This is not to say that you must be permissive and let your dog sniff every possible thing; it’s about finding a balance between your needs and your dog’s needs. Sue Ailsby in her book Training Levels uses the analogy of friends holding hands during a pleasant walk: when one wants to stop to look at something, the other stops and waits. The chance to stop and sniff something can be used as reinforcement for a loose leash. Put “Go Sniff” on command and get there together on a loose leash. Congratulations! You are now even more awesome in your dog’s eyes because you are the source of something your dog loves. It’s important to note that dogs often sniff when they are stressed and when they are signaling to another dog that they are not a threat. If your dog wants to stop and sniff, let him, as long as it’s safe. If you’re worried about time, then walk for time (not distance) and head for home at halftime. If approaching dogs tend to cause your dog to react poorly, try this before your dog has a chance to react: toss some treats on the ground for your dog to sniff and find or guide your dog to something that is sure to have some good scents (e.g. fire hydrant, tree trunk, fence edge). Remember to consider your dog’s health: be sure you can see the area he’s sniffing so he’s not likely to ingest dangerous items, and if your dog’s immune system is weak, avoid letting him sniff places where dogs of unknown health may have urinated/defecated. Consider the types of injuries that can occur in the neck area from pulling and jerking on the leash, such as spinal injuries, pinched nerves, thyroid damage, eye and ear problems due to restricted blood flow, and interference with the nerves in the front legs, and a collapsed trachea. It’s essential that you take the pressure off this area. Many dogs have problems with impulse control and over-reactive behaviours, making walks very difficult. Some people turn to pinch, choke, slip, or shock collars for their promise of an instant fix. Sometimes they can be an “instant fix” but they don’t address the underlying cause of the pulling behaviour, and these collars often cause behavioural or physical problems. Properly fitted harnesses take pressure off the neck and spine and are the most comfortable choice (as long as they are not the type that are designed to cause discomfort when the dog pulls). Contrary to a popular myth, harnesses (even back clip ones) don’t teach a dog to pull. Harnesses make it more comfortable for the dog if he does pull, but the harness doesn’t “teach” the dog to pull. Letting a dog pull where he wants to go teaches a dog to pull, regardless what type of collar or harness he wears. If there is a risk that your dog will slip out of the harness, be sure to get a safety clip that attaches the harness to the collar. 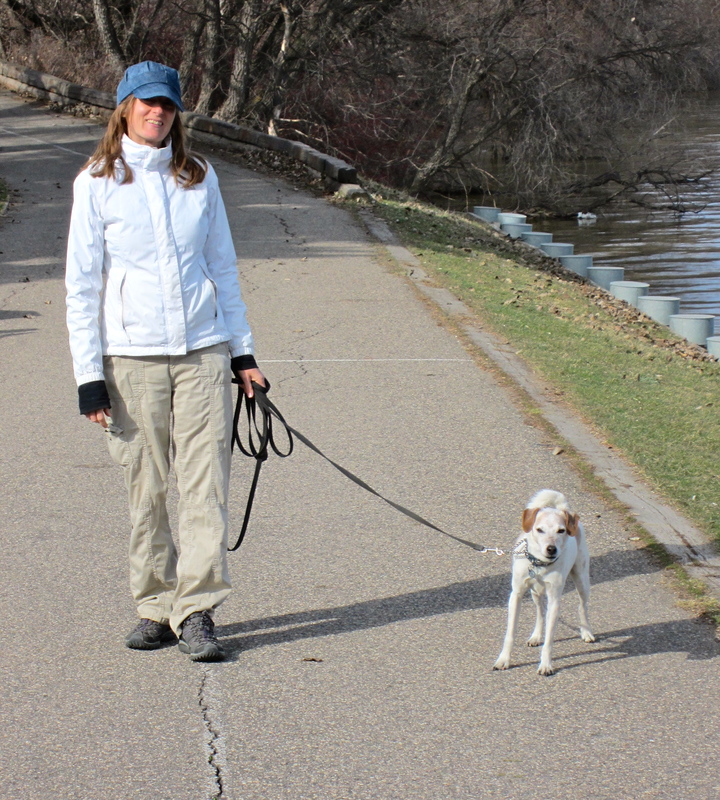 No one likes to walk a dog that pulls on the leash, but that doesn’t mean the dog has to walk precisely by your side. The formal heel position isn’t necessary for a relaxed, everyday walk, and for a dog who pulls, setting such high standards at the beginning is likely asking too much of the dog. I suggest lowering the criteria to merely requiring the dog maintain a loose leash and then improve skills from there if you wish. NOTE: retractable leashes are not safe. It is very difficult to quickly pull your dog close. Many people let dogs on these leashes get too close to other dogs, causing fights, tangled leashes, and rope burns or cuts. (If the dog is heavy enough and the leash is narrow enough, it can sever a finger.) When a dog hits the end, the sudden stop can cause physical and emotional trauma. As well, these leashes are difficult to hang onto when the dog pulls suddenly, and many dogs have been known to run away from the scary handle banging along the ground behind them. It’s essential that you rethink the purpose of the leash. It’s a tether, not a towrope; a safety line, not a fishing line. Try to avoid pulling unless you absolutely have to, such as to get your dog away from something for safety reasons or get him away from the trigger causing him to lose his mind. If you merely want to direct your dog to move beside you or to come towards you, use other means: coax with your voice, take a step or two backwards, use a piece of food or toy to lure the dog where you want him to be (fading the lure later), teach your dog to follow your hand, etc. Break the habit of directing your dog’s movements by using the leash and teach him how it feels to move about on a loose leash. It’s also important to understand why dogs pull when on leash. Humans are slow and boring on walks and the dog has learned that pulling gets him closer to exciting things more quickly. Because of this, the most important rule you must teach your dog is this: he gets to go where he wants to go only when the leash is loose. Remember this always. If you let him pull sometimes, then you are reinforcing the pulling behaviour like a slot machine that pays out intermittently. Try using praise, food, or toys to reinforce him for being beside you, starting with a high rate of reinforcement then gradually reducing the rate as he improves. Talk to your dog to keep his attention for short periods of time, do some training exercises to help regain his focus, and use the environment to reinforce loose leash walking (e.g. let your dog get to an interesting spot on a loose leash). A lot of pullers have problems with over-reactivity, so you will likely have to address this first (see below). Consult a skilled positive reinforcement trainer to help learn how to reward your dog for doing the right thing rather than how to punish him for doing the wrong thing. There are other things you can do to help set your dog up for success. Let him burn off some energy first with a moderate play/training session. Practice loose leash walking in the house and then in your yard before trying it out in the neighbourhood. Begin asking for self control the moment you pick up the leash, and require it before continuing with each stage of the walk (e.g. leashing up, opening the door, out the door). Walk back and forth over the same area to make it less exciting, and walk for time rather than distance so you won’t be tempted to rush and let your dog pull; you’ll notice your dog will get further in the same amount of time, and your dog will figure out that he gets to see and smell more things the better he walks. Most over-reactive behaviours are due to fear or frustration. (If pinch, slip, choke, or shock collars are being used, it is likely the dog has reactivity issues — either prior to the collar use or as a result of its use.) Walking with a loose leash is essential in this case because a tight leash adds tension, so give your dog enough length to make a choice. If the dog knows how to walk on a loose leash in a low-distraction environment (e.g. in the house, in the yard) and is making the leash tight on a walk, then that is a clear indication that dog is over his threshold. Treat the tight leash as information about your dog’s level of arousal and move him to a less intense environment so he can make better choices. Choose locations and times that limit your dog’s exposure to triggers, and if you need to, drive to a different location to avoid your stressful neighbourhood. Addressing over-reactive behaviours requires systematic desensitization and counter conditioning, not leash corrections and equipment to punish or suppress behaviours. Some trainers offer classes for dogs that are over-reactive to other dogs, but these classes might sensitize your dog further if there isn’t the space that your dog needs, if there are too many dogs, or if the trainer doesn’t have the expertise. A dog with reactivity problems needs enough distance from the trigger in order to be aware of it but not anxious, otherwise he will become more sensitized to the trigger.